It’s not often that I find myself dropping RMB 80 on a bowl of noodles. It’d be plain wrong of me to say that these dishes aren’t worth spending money on, but Shanghai has such a smorgasbord of great value, epically delicious bowls that I’ve never really found the need to. 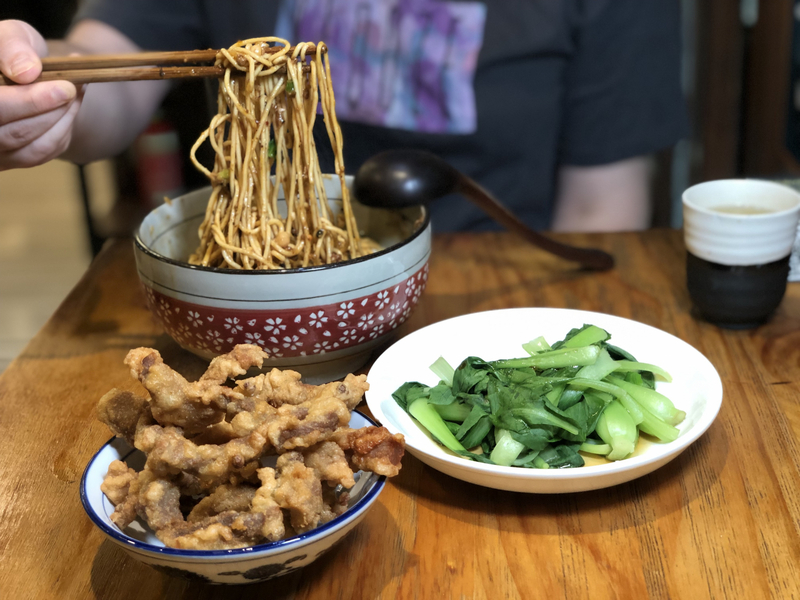 But what do you know – recently I sat down to a meal for four, spent RMB 100 per person on noodles and a couple of shared sides, and left feeling pretty great about it. Even weirder, it was at an anonymous chain store on the top floor of iAPM. 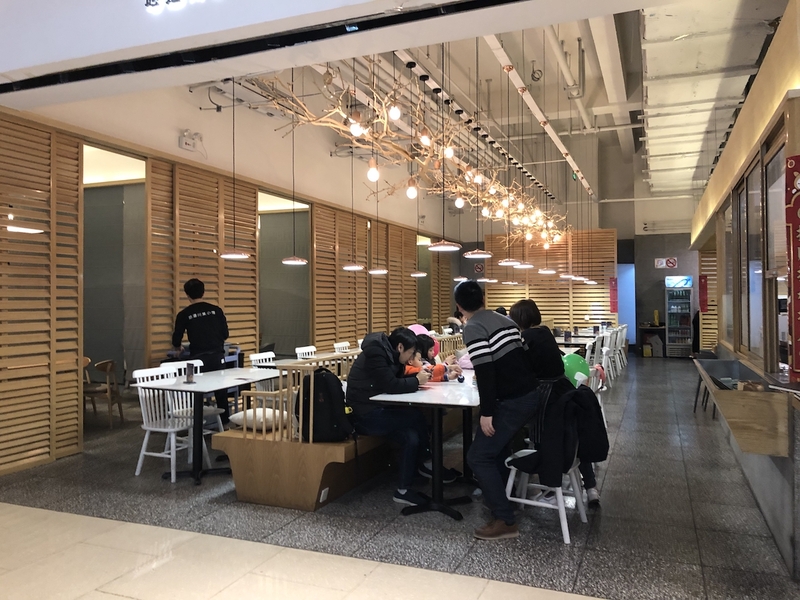 The place is literally a counter-top kitchen with food court-style seating around it, so its light on atmosphere – and will be anathema to those that hate dining in malls on principle – but hey, service is quick and it’s easy to get in and out. The noodles that convinced me are the lightly spicy bowl of dry beef noodles, sprinkled with shavings of thinly shaved high-grade beef and smothered in thick sesame sauce, with a runny poached egg to break apart and stir in. Man, these things. So rich, so hearty, so addictive. Loved them. Also have a lot of good things to say about the spicy stinky tofu noodles that one of my dining partners had. All the noodles had this great toothsome, al dente texture that I really liked. A lot of people wouldn’t bother coming here when there’s an Ippudo Ramen downstairs and so much great, affordable Chinese food elsewhere in the neighborhood around this mall. Fair enough. I’m not trying to eat here every day. But, it’s something different and something delicious - I’ll be back. Summary: Pricy but solid noodle bar on the top floor of iAPM serving up bougie mian, food court-style. There’s no atmosphere and you’ll pay a premium, but ingredients are quality and the flavor is there. Worth stopping by to try out their beef and sesame sauce noodles. 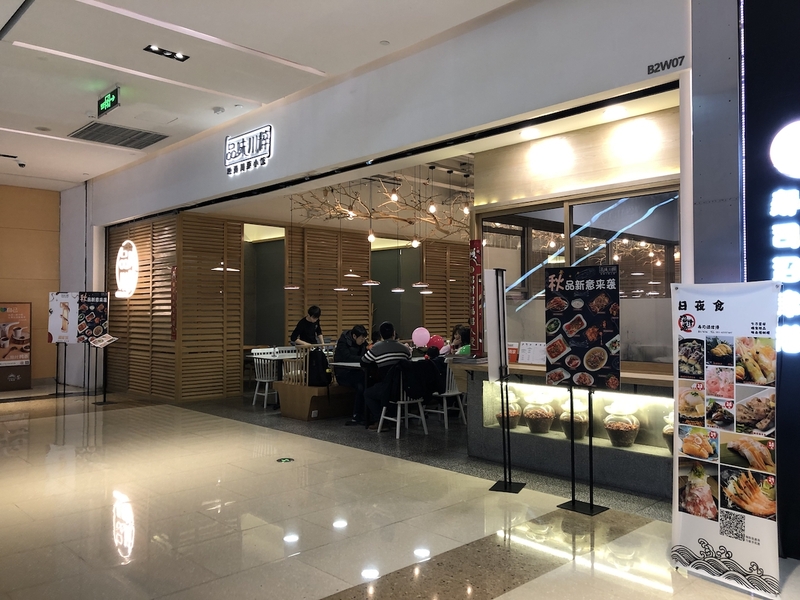 The Lakeside Veggie, a vegetarian restaurant in new and pretty nice shopping development Shi Guang Li mall not far from the West Bund area, feels pretty fancy. It’s decked out like the banquet hall of a stately country home, with high ceilings, chandeliers, and big private rooms. It’s a bit much maybe, but once you settle in its kind of charming. It’s kitsch, intentionally or not, and more atmospheric and date-worthy than your average mall resto. For whatever reason, the self-conscious refinement of the setting and the attentive service made me worry that the food would be a little tame. Fortunately, I was proved wrong. They aren’t afraid of salt and a little oil at The Lakeside Veggie like they are at other vegetarian restaurants. There is plenty of bold seasoning and great cooking to be impressed by and savor. We hit up the Dianping deal that gets you a spread of their signature dishes at RMB 258 for two. 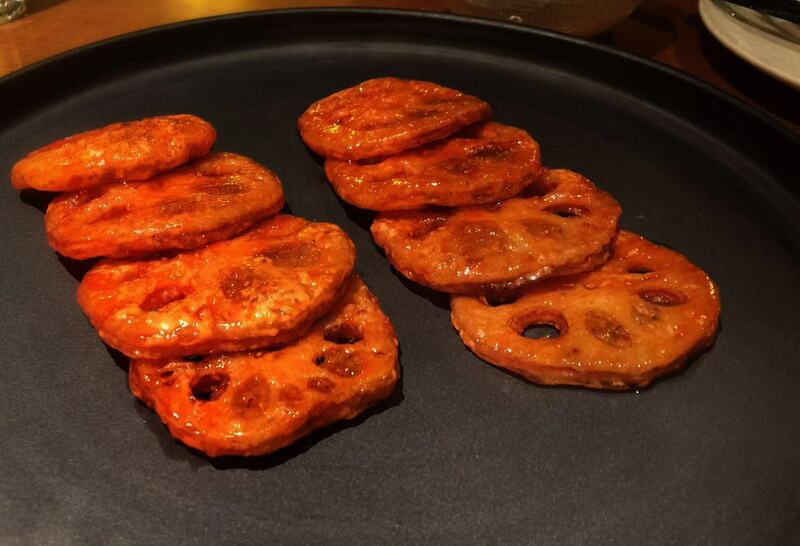 Fried, mushroom-stuffed sweet and sour lotus root slices are a crunchy, satisfying starter, as are chilled mala mushrooms (a meat-free replica of Sichuan favorite fu qi fei pian, or spicy beef intestines). Stir-fried mushrooms are a highlight, as is the mushroom soup served in a tea set - its rich, earthy, and nourishing. A lot of depth. Lot of mushrooms on the menu here. The set also includes a selection of iced vegetables, served with soy sauce for dipping. 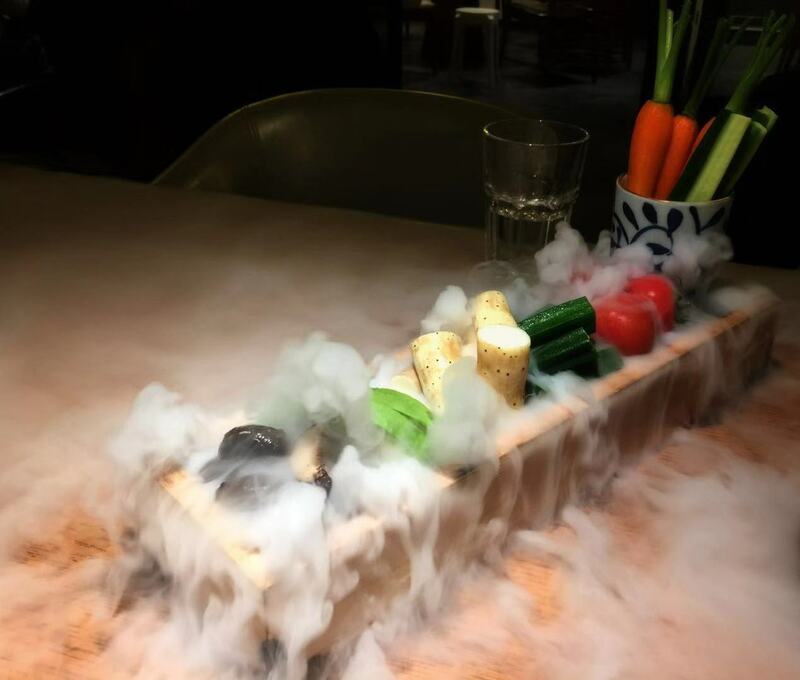 They pour water into the serving board to make loads of steam pour out of it, covering the veggies and the table. It looks great. Decent Moments / Instagram fodder, but it’s probably the least exciting part of the meal flavor-wise. Fresh vegetables, though. 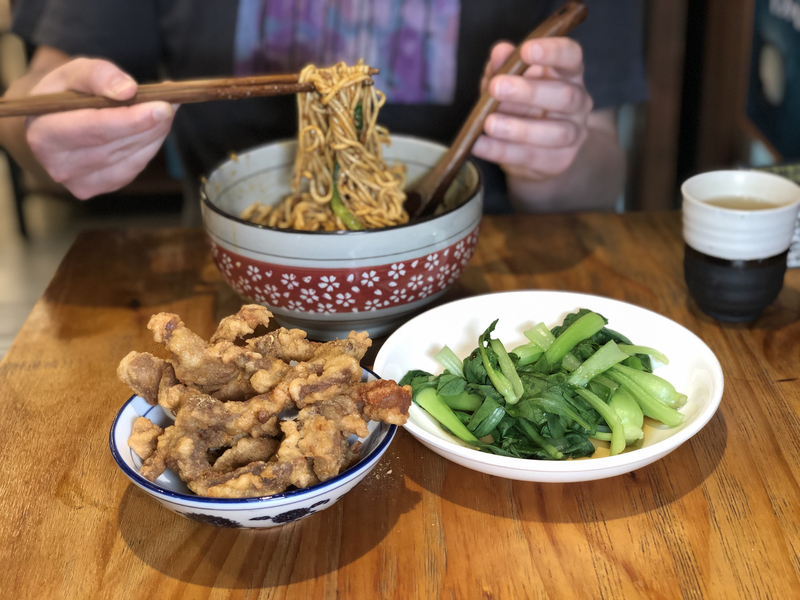 It might be out of the way for some, but The Lakeside Veggie is more than worth the trip whether you’re looking for a new meat-free spot or just looking for a place to find some fresh, interesting Chinese cooking. Summary: Spiffy vegetarian restaurant offering up fresh ingredients and quality meat-free cooking with plenty of flavor in a mall down south. Decked out pretty fancy with a few private rooms and good service, but reasonably priced. A cut above your average ‘faux meat’ joint. Fish ‘n’ chips pops up a lot on menus in Shanghai, but it’s hard to find somewhere that specializes, even harder to find somewhere that specializes and does it well. Fish+ does. It’s easily the tastiest and closest in style to back home in the U.K. that I’ve had in Shanghai. It’s the fish that makes it. Firstly, they actually use cod, and secondly, the batter is the right crunchy consistency, clings to the fish with every bite, and is well-seasoned. It’s the real deal basically. 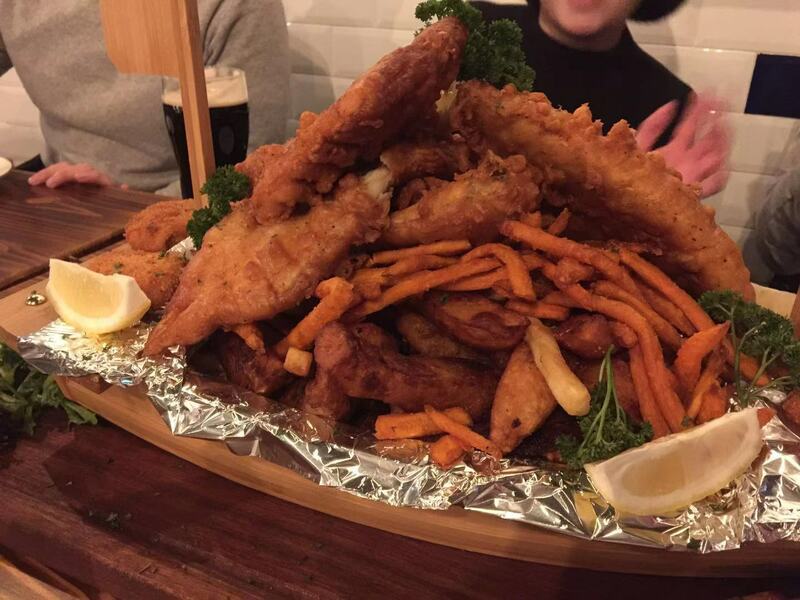 If you’re in a group, consider going for the “Cod’s Tower”, a pretty insane mountain of huge fried cod fillets and king prawns piled on top of three different kind of chips (sweet potato, standard, and triple-cooked wedges). It’s a monster serving and great value at RMB 500 – it could easily fill five people, probably six. Good for the Moments, too. Sides, like those aforementioned chips, cheesy baked potatoes, and mushy peas, are all on point. The main quibble is the space. They operate out of a room in front of beloved/behated dive bar BnC’s, and though they’ve gamely decked it out with the odd bit of British kitsch, you can tell. You’re probably not coming here for a date. Hopefully business goes well enough for them to graduate to new digs, because the food deserves a better space. A more robust drink selection would be welcome as well - the waiter mentioned to us that they’re working on at least rounding out the beer selection. On pure food terms, though, Fish+ is definitely a winner. Summary: Quality fish and chip joint in North Jing’an serving up classic battered cod and triple-cooked fries and some other British staples. Great sides and sauces. Operates out of the front of a dive bar, so you’re going for fried goodness, not the vibes. Sometimes you need a restaurant in your life to pat you on the back, give you a cold beer, and just send you on your way feeling better. That’s what Kyushu’s is. 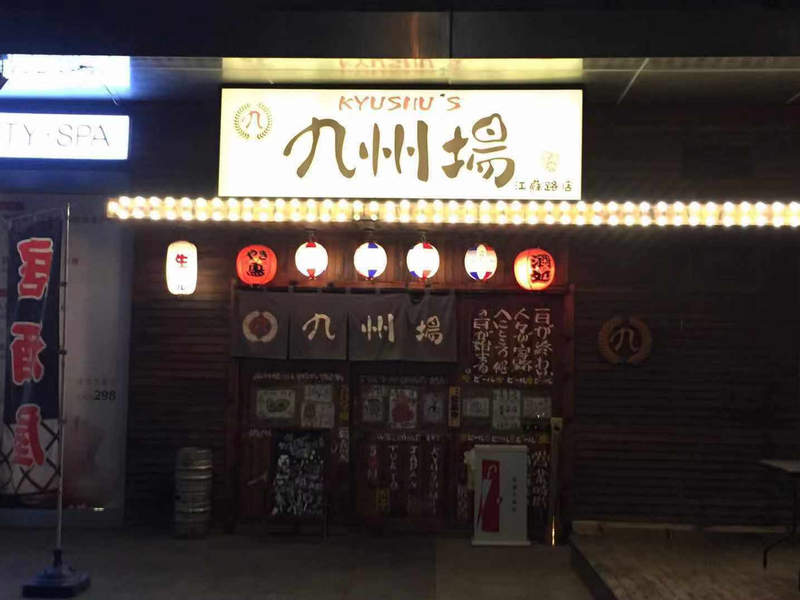 If you’re in the neighborhood and looking for a convivial atmosphere, a boozy dinner to start a night-out, or just some solid Japanese-style grilled food and beer, Kyushu’s is your friend. It’s usually busy, especially on weekends, which gives it a reliably good atmosphere. It’s also colorful, with walls covered with Japanese posters and TVs showing random pan-Asian soap operas. It’s pretty cozy, and just on the right side of kitsch. 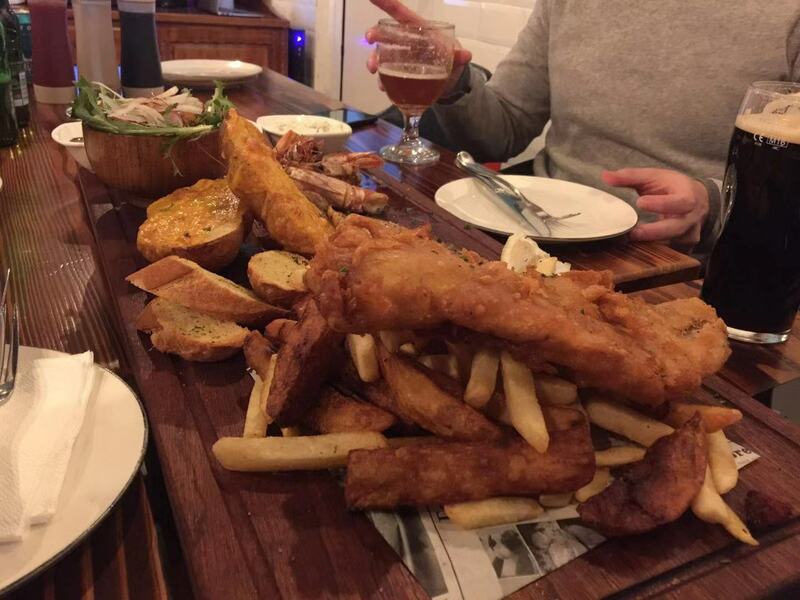 Food is – stuff that goes well with beer. Think barbecued meat and vegetable skewers, fried chicken, grilled fish. I prefer going in groups, ordering a bunch of skewers and dishes to split and covering a lot of ground on the menu. As at any Japanese grill, the mackerel is a must. 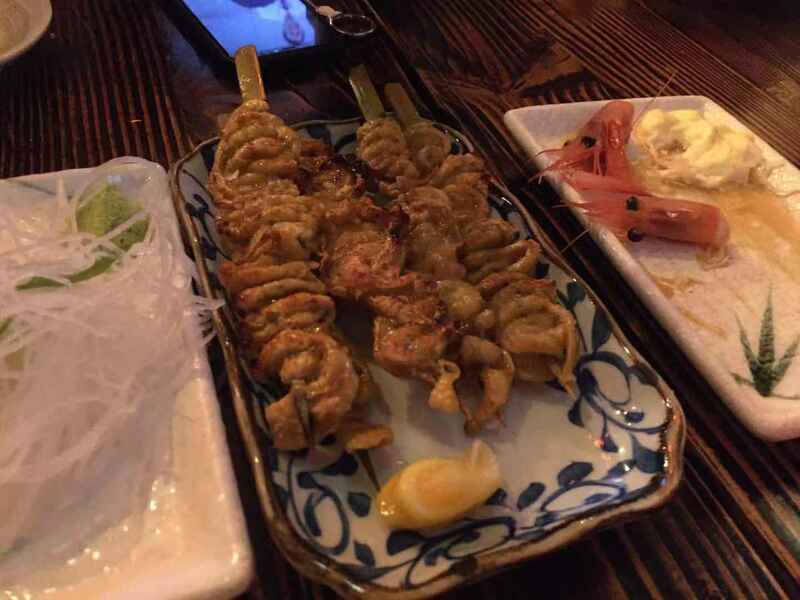 There are particular items they really excel at (the chicken skin skewers are great examples of the form, better than a lot of other places) but it’s generally just what you’d expect from a better-than-average Japanese BBQ joint. Which is no bad thing. The menu covers a wide range too, which is a bonus – it’s good for boozy, hours-long weekend group dinners, but also a decent shout for a cheap, in-and-out solo bowl of ramen. The spicy tonkatsu is decent. It’s a low-stakes spot that’s always satisfying, and always a good time. It’s dependable. That’s why, despite often swearing I prefer other places that do a similar thing, I keep going back. Price: RMB 170-200 per person, including drinks. Summary: Standard issue Japanese izakaya in Changning district, serving up decent grilled skewers, cold Asahi, and good vibes. There are better ones out there, but this is a great option for the area. Usually busy, so doesn’t hurt to reserve. Pin Wei Chuan Cui is a crisp, functional operation in the basement of one of the newer mall developments on Hubin Road. They serve up a full menu of Sichuan classics that, while inoffensive, feel watered down for Shanghai palates. There’s way worse “Sichuan” food out there on the streets of Shanghai, but you won’t leave here with your mind blown or your nose running. The vibe is one of a spruced-up canteen, clean and simply decorated with an entirely open storefront facing out onto the mall floor. It’s light on atmosphere, in other words, but its bright and open with good service. They have a handful of private rooms for larger parties, if for some reason you’re heading here but looking for something more intimate. Prices are friendly for this neighborhood, too. The small selection of Sichuan staples comes out looking the part but leaving a little to be desired. 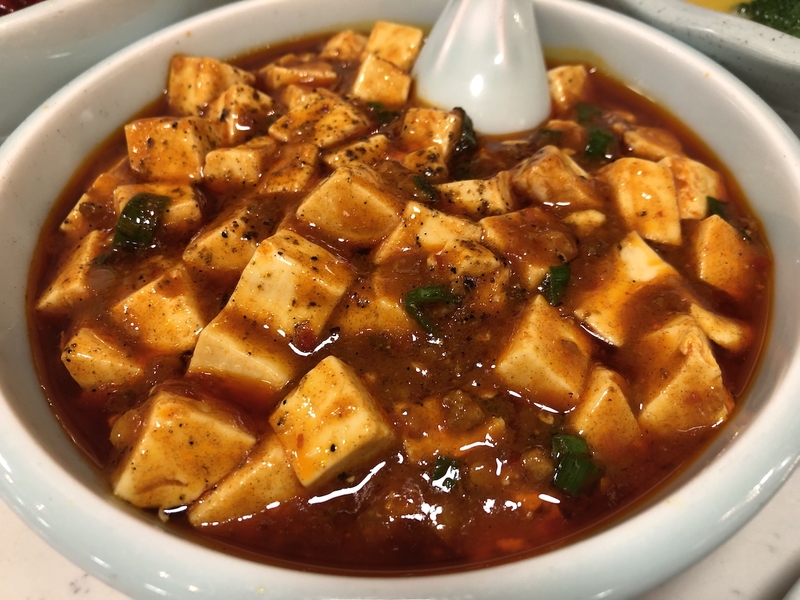 The mapo tofu, always an important indicator of whether a Sichuan spot is up to snuff, is muted with just a hint of numbing ma and not much else besides, the sauce lacking any real complexity. Their shui zhu niu rou (beef, cabbage and other vegetables cooked and served in hot chili oil) is better and richer, but still doesn’t linger on your palate the way you’d want. 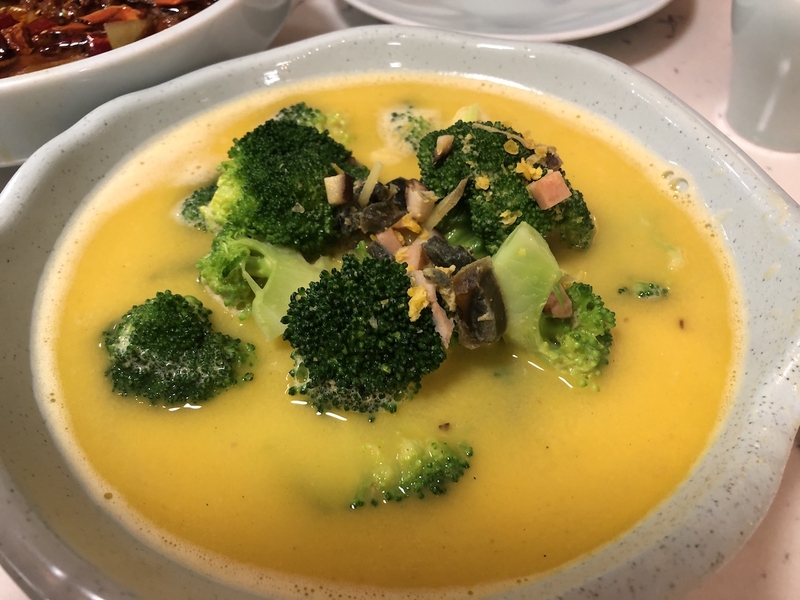 Broccoli served in a salted egg yolk broth is fine, but maybe try another dish if you’re looking for something green. Maybe this is all good if you like these flavors but are squeamish with heat. I like to sweat when I eat this stuff. Sichuan food isn’t all about spiciness, but it is very much about bold flavors. It should be exciting, and these versions feel pretty workmanlike. They get extra points for doing a pretty great bing fen, a kind of ice jelly common in Sichuan cuisine as a kind of cooling snack or dessert. 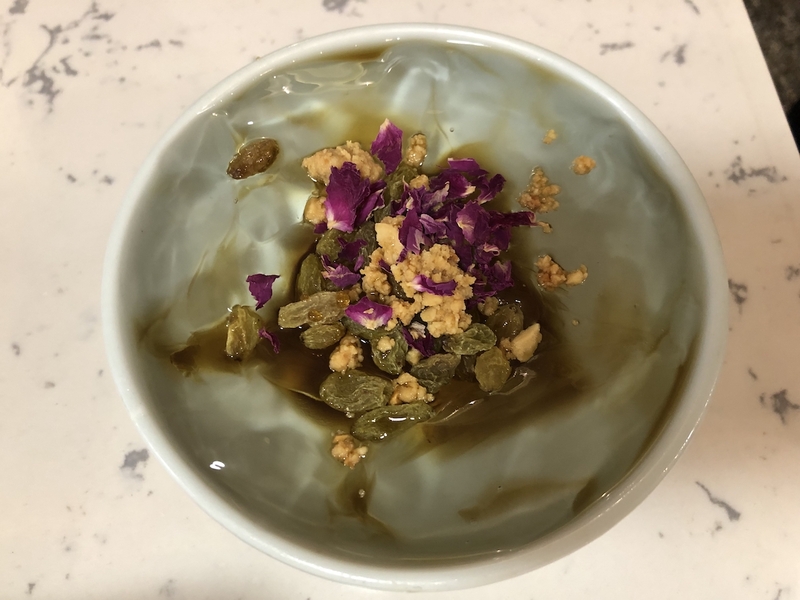 They push it hard on their Dianping page and it is indeed pretty good, topped with flower petals, crushed peanuts and raisins with a pool of rice wine at the bottom. It does, however, kind of make you wish that you’d just eaten something spicier, that your mouth actually needed cooling down. 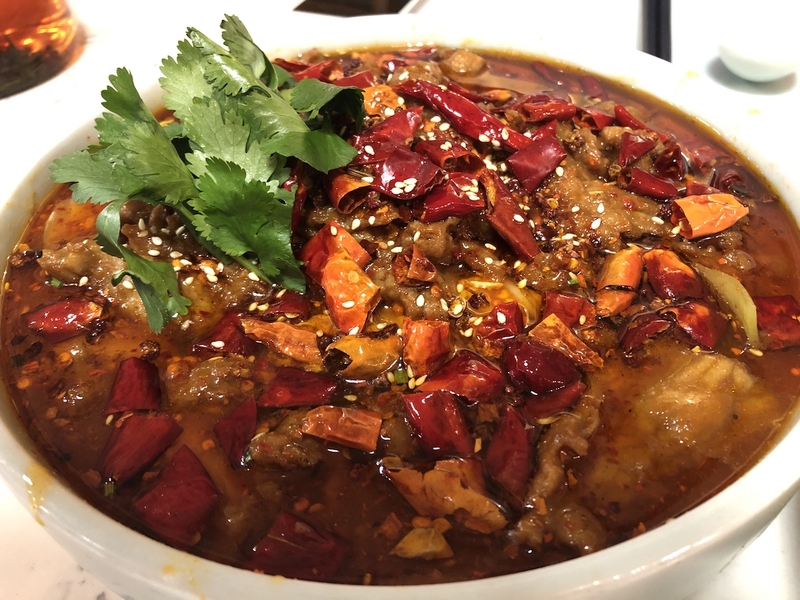 It’s worth stopping by Pin Wei Chuan Cui if you’re in the area and feel like some solid enough, reasonably-priced Sichuan staples, but not worth travelling for or using as an introduction to the cuisine. 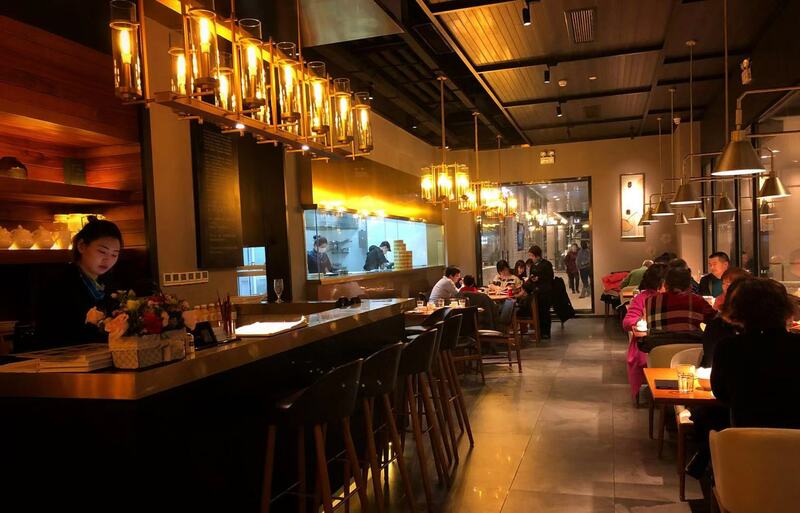 Summary: A clean, serviceable mall spot near Xintiandi serving up all the greatest hits of Sichuan cuisine, toned down for local palates. Nothing terrible about their renditions of the favorites, but the spiciness and flavors aren’t quite there. Prices are good, especially for the area. Chi Zai Ji offers up a menu of classic Cantonese snacks for everyday prices – you’re looking at roughly RMB 50-60 per head for a few plates, without drinks. This is often a cuisine that you end up paying a bit more to enjoy, so it gets points for that off top. It’s also a great way to satisfy a craving for these flavors when it’s not the time or place for dim sum (i.e. for dinner). 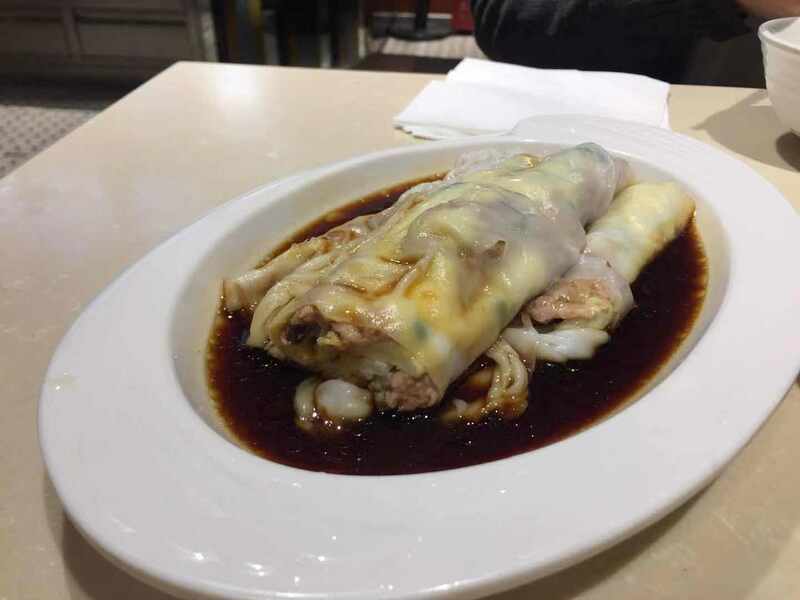 The rice noodle rolls are a specialty and a highlight, slippery rice noodles with a choice of filling that are hard to pick up and fall apart quickly, but are a unique pleasure to eat thanks to the competing textures of the dish. The barbecue pork ones are great. They come drowned in soy sauce, which also helps. 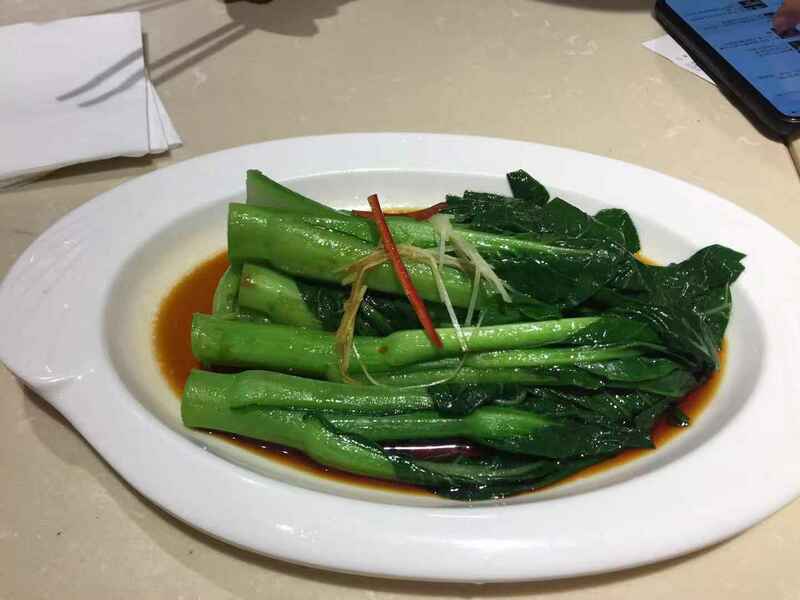 From there you can get everything from crispy spring rolls to pan-fried turnip cakes (also seriously good) to simple sautéed “Chinese broccoli”. They’re all solid. Add a bowl of claypot rice if you’re trying to fill up, or congee if that’s your thing. 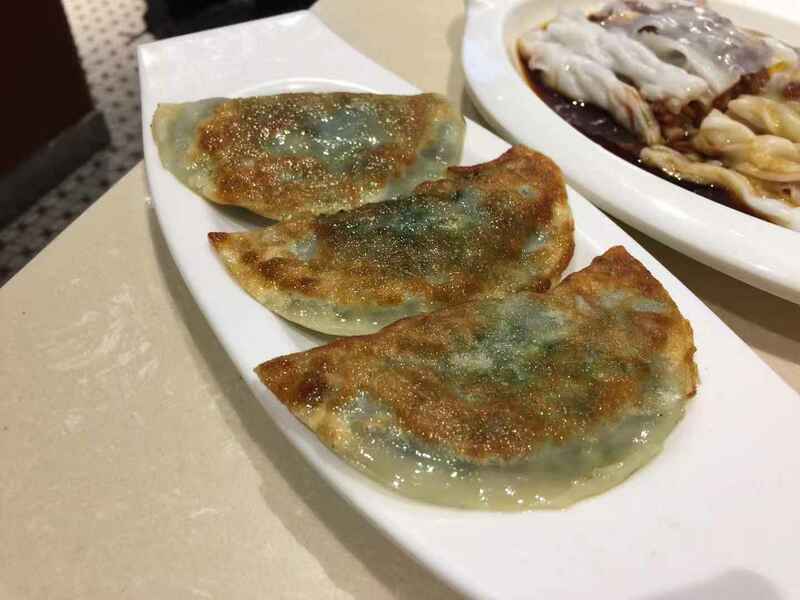 In all this is a very strong option for a quick, very tasty, and wallet-friendly feast in a neighborhood that has a lot going on, and a good way to get better acquainted with some lesser-known favorites of Cantonese cuisine on the cheap. Summary: Cheap and cheerful spot on Xiangyang Lu pumping out Cantonese classics like rice noodle rolls, claypot rice, crispy spring rolls and more. Great for a cheap couple’s dinner or a quick solo bite in a central neighborhood. Announcing your favorite burger in Shanghai is always going to be a controversial exercise, but for me, Must Grill is it. It doesn't appear in the conversation enough. It all comes down to the quality of the ingredients - the fresh, chewy, perfectly cooked patty, the house-made milk buns and the attention-to-detail toppings. The bacon and the pulled pork they throw on the American Dream, or the fried ball of Goat’s Cheese on top of the Baa Baa, have had thought put into them. Which is funny, because it’s not strictly a burger joint. It’s more of a mid-range French grill, with a lot of steak and other meats on the menu alongside some French classics and a pretty decent wine list (if I’m not mistaken, at least one French wine importer owns a stake - always good for pricing). The place in general is a pleasant mid-range Euro-style bistro, with a great terrace for summer and an ambience that sits at the right intersection of casual and classy. Good for group meals, good for a date. Great service too, especially if the French manager is around, which he usually is. 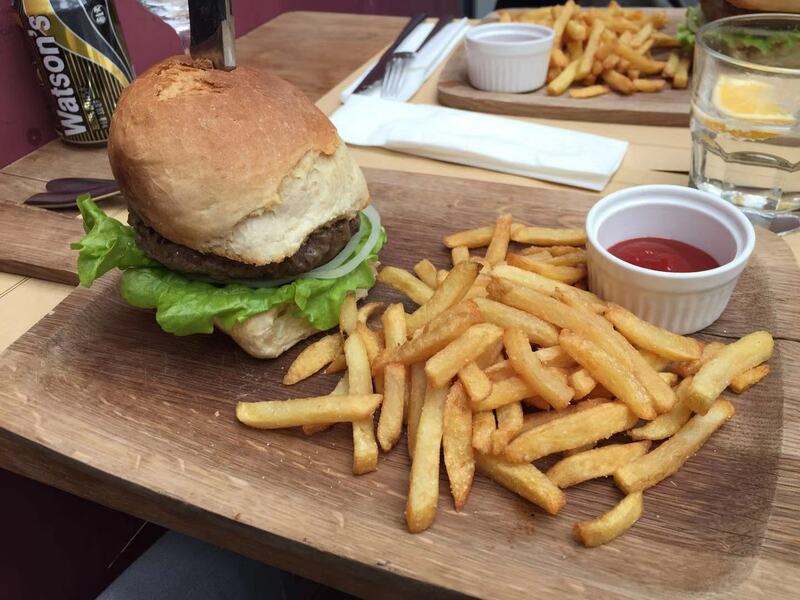 But the burgers are what keep me coming back. Each one will set you back pretty much RMB 100. Hardly a steal - what you need to do is head there on Tuesday, where all burgers are buy-one-get-one-free, and when the place is seemingly at its busiest. It’s my pick for best burger deal in town. If you live or work in the area they do a lunch set, too, starting at RMB 88 for two courses. 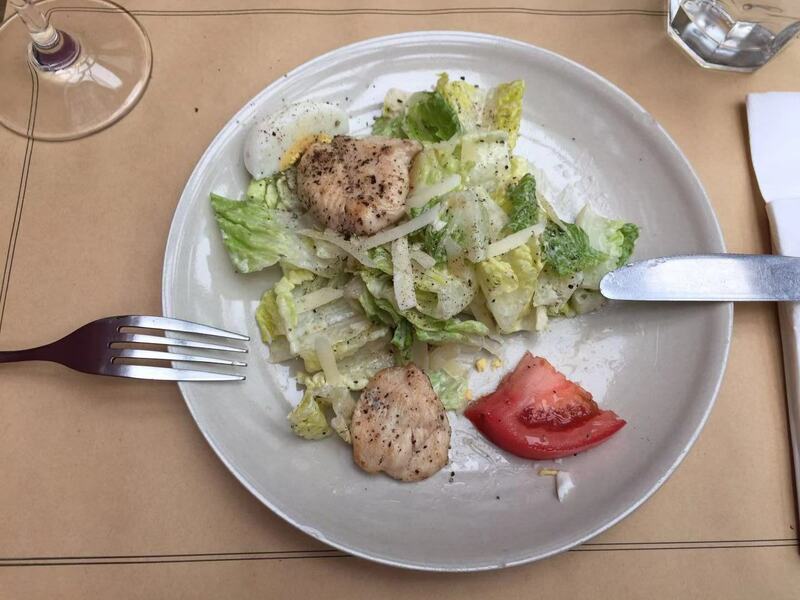 Again not cheap, but everything is on point - the chicken salad starter is great - and you’ll leave stuffed. The restaurant itself is hidden from the street and so doesn’t get a lot of foot traffic, which means it’s rarely packed. Crowd is predominantly French, often a mix of young professionals there for the b1g1 burgers and well-heeled shirt-and-tie expats enjoying a few bottles of wine and a three-course meal. Whether you’re trying to get some affordable but quality Western food and wine or just want to find your new favorite meat-in-a-bun, it’s worth the trip. Once you’ve learnt to love Korean food, it’s the kind of thing that’s easy to crave. Good kimchi hits a spot that not many foods do. And Korean BBQ, good as it is, is kind of a big, boozy, occasion-type meal. You don’t eat it all the time. Props to places like Hanguo Chufang, then, diligently pumping out Korean comfort food that hits all the right notes on flavor, at prices you actually can justify every week. The space is casual and friendly, a little cramped, spread over small second-and-third-floor dining areas. You pass a window looking into the kitchen on the way up, and are greeted welcoming yells from the waitstaff and chefs. I go here for the rice bowls when I need a big, filling lunch. They range from standard bibimbap, which is just OK – they skip the runny egg, which feels like a travesty to me – to much tastier versions like beef bulgogi and spicy kimchi pork, my personal go-to. You couldn’t really call these things totally authentic – they use that weird purple rice, which I don’t recall eating in Korea - but man, are they satisfying. The kimchi is funky and pungent, they don’t skimp on meat, and the flavors are all there. The pots stay piping hot for the whole meal, crisping up the rice on the bottom and making it a perfect winter warmer. They give you a spicy, bright red gochujang sauce to stir in as well. You’ll be sweating after. Some people struggle to finish the bowl; I’m not one of those people, but I’m definitely full after. At between RMB 35 to RMB 45 – including free rounds of black beans, kimchi, and other Korean pickles to start – they’re great value too. Love those freebies, which roate depending on when you visit. On a recent visit I got a really tasty pumpkin soup. These things are easily enough for a meal for one, but to supplement there are the usual suspects - think serviceable Korean fried chicken, satisfying seafood and kimchi pajeon, Korean stews. Good for grabbing if you’re there for dinner or going as a small group. In all, this spot is a simple, fuss-free way to fill up on hearty and warming fare and get your Korean flavor fix. Oten for not much over RMB 50 a head. The best soup you'll find in a mall? Song Fa is a Singaporean chain that specializes in Bak Kut Teh, a complex pork rib soup that has roots, I believe, in the Chinese communities in that country and Malaysia. At Song Fa they do versions with various parts of the pig, the classic being the ribs. They also serve up the broth as the basis of a bowl of noodles. Any of these will set you back somewhere between RMB 55 and RMB 70. The broth is soothing, rich, and delicious, packing all the richness that comes from having gotten to know the bones of a pig very well. It also packs a massive whack of pepper that startles on the first sip but really cuts through that aforementioned richness. It’s really well done. If you’re a couple, you can split a couple of soup dishes with some sides. The fried tofu, pictured, is particularly tasty. The broth tastes great spooned over a bowl of rice, too. What takes it over the finishing line is that they do free refills of that soup. 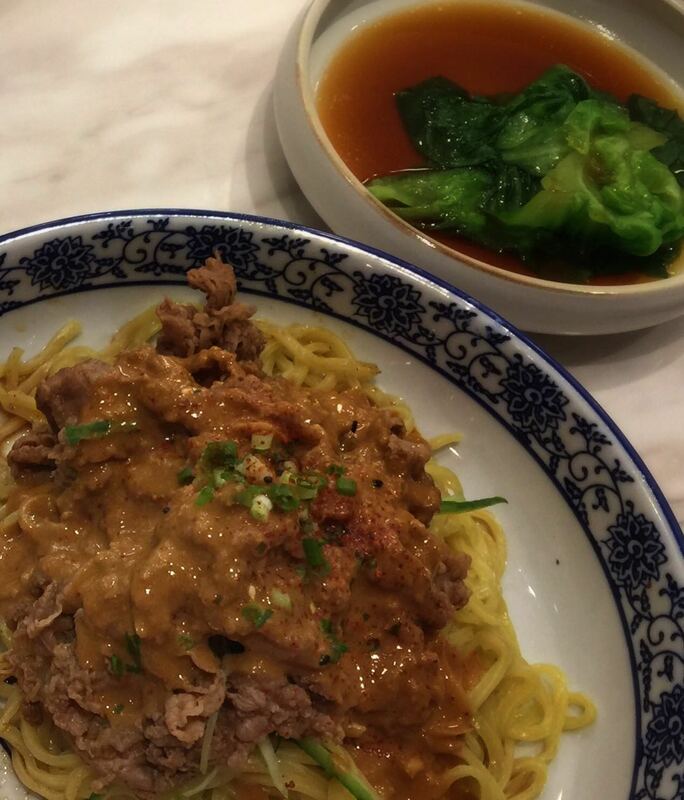 Whether you’ve ordered the pork rib soup or just a bowl of noodles, the wait staff are constantly circling with hot kettles of the stuff ready to be added to your bowl. I get excited about free refills of anything. When it’s delicious pork rib soup, then I’m guaranteed to be almost inappropriately pleased. Atmosphere is – mall. Not what you come for. Service is great. Food-wise, there are some quibbles. The meat clearly hasn’t spent quite the ideal time cooking – it tastes great and is tender enough but doesn’t fall off the bone the way you would hope. Also, when I asked a Singaporean friend about Song Fa she said that they’re a respected chain, but also mentioned some elements – mostly tasty-sounding condiments – that I didn’t see at this Shanghai outpost. Those are minor issues to me though. All in all, it’s a great place to get a well-priced, very soothing meal in this part of town. Folkjar is a restaurant chain (Chinese name Shan Jian Tang / 山间堂) that focuses on the dishes and soups of Jiangxi province. This is a cuisine that doesn’t get that much love in Shanghai – it’s not one of the “eight greats”. So, for the uninitiated, it’s known for spiciness and fermented funkiness, not totally dissimilar from the cuisine of neighboring Hunan. They’re also known for their “Nanchang Jar” meat soups, which are the specialty here. This is perfect winter food. We went for one big jar of soup and three dishes, which all turned out to be great supporting players; meltingly tender eggplant and long beans, fried tofu laced with chili in a rich gravy-like sauce, and slippery fried noodles. It’s all pleasantly rich and pungent, packing some unique flavors. It was also too much food for less than RMB 100 per head. That soup though. Their large bowl of bamboo and duck soup might taste a little flat at first, but stick with it and you’ll be rewarded by a broth that gets richer and richer the deeper you go, collecting more and more tiny pieces of duck meat and rendered fat. They aren’t stingy with the meat either, offering plenty of hefty chunks. Like real, boneless chunks. Jiangxi is still on my list of places to visit, so I can’t really speak to the authenticity here, but these bowls pack a whole lot of comforting warmth and a whole lot of flavor. Being a chain, you do get that vaguely corporate vibe; low on the atmosphere and overly cutesy, pretty high on good service and professionalism. Serviceable; fine. And yet, by making something as simple and unvarnished as a hearty duck soup that’ll keep you warm for hours afterward, they’ve managed something pretty homey. Visit while it’s still cold out. Some people hate hotpot, seeing it as a waste of good ingredients and a uniform experience in which everything just tastes like your dipping sauce. Others, like me, see it for what it is; a meal in which both the lip-tingling, bowel-shattering food and the act of dining itself are equal end goals. It’s participatory, communal, an occasion in and of itself like Korean BBQ or fondue. Great fun when you’re drunk. The best hot-pot places, obviously, are the ones where the food isn’t just an afterthought. Lao Wang is one such spot. It’s difers from common go-to Hai Di Lao by shedding the over-the-top service for a more refined vibe and gentle décor (the wait staff are still on point, though). You also get higher-quality ingredients – just try the beef balls here and tell me that’s not the case. That all comes for a slightly higher price point, but you’re still spending comfortably less than a RMB 200 a head. The main selling point here is the unique chicken and pork tripe cooking broth, basically an intensely peppery and rich chicken soup. This was a revelation to me on my first visit. Once it’s heated up, the first “course” of your meal is a bowl of this, spooned out by a waiter. Then you help yourself to the chicken and piggie bits floating around in there before getting to cooking your vegetables, sliced meat, tofu, and whatever else you like. After the broth, it’s the aforementioned quality of these ingredients that take Lao Wang over the line and make it a truly top-tier hotpot joint. As a glutton for punishment, I like the pot split half/half between a standard, numbing, Sichuan-style spicy broth and the signature chicken elixir. 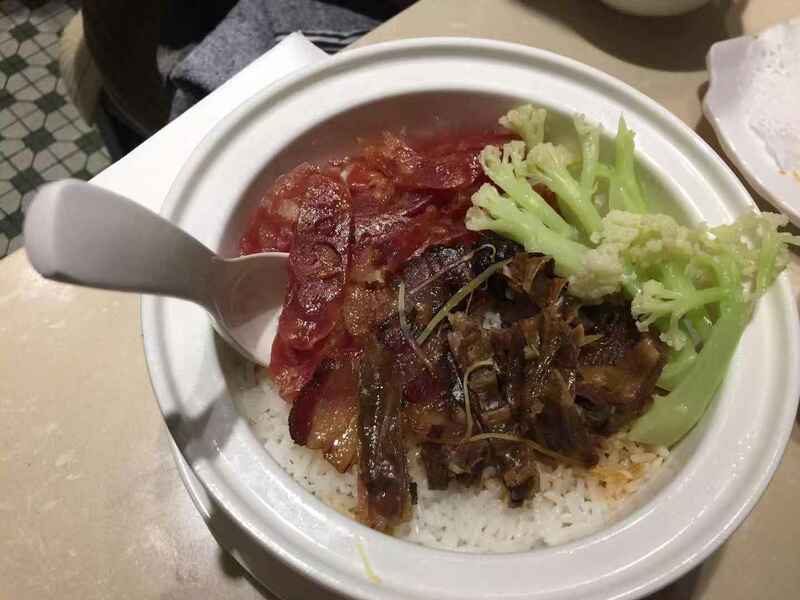 I’m also very partial to the Cantonese-style crispy claypot rice, mixed table-side with cured meats and greens. It’s a great, flavor-heavy way to add a bit of bulk to the meal. The place gets busy, especially on weekends, but it’s worth the wait and manages to keep hold of its pleasant atmosphere even when things get convivial. Next time you’re looking for a hotpot place, this should be top of your list. (Also, everything only tastes of the dipping sauce if you don’t mix your dipping sauce right. To step your game up all you need to do is keep a light touch and go easy on the peanut sauce). Wu Guan Tang is a picturesque vegetarian restaurant built into a lane house on Xinhua Lu. It has atmosphere; it’s pleasant and refined, with good service, a tranquil environment and décor that’s reminiscent of a classical tea house. Casual enough for a dinner with friends but just refined enough for something slightly more high stakes, like a date or something more formal. It’d be good to take any visiting veggie out-of-towners. I’ve also heard that they have a killer rooftop patio, but the November weather prevented us from exploring. Will be back to try that. They do set meals for different sized groups, which is a good option if you’re looking to sample a few of the highlights. Prices are slightly higher than your average neighborhood Chinese spot, but not by much. Three of us ordered the set dinner for two and threw some extra dishes on top, and it came out to RMB 100 a piece. Highlights include okra that arrives slathered with a little chili alongside a rich, sour and spicy dip. Potato comes baked, sliced and dripping with butter, a testament to the fact that vegetarian food can clog your arteries just as nicely as any meat dish if you let it. Sides like pickled radish and cold tofu provide decent, if not thrilling accompaniments. The set provides a deep range of flavors, and it’s clear that ingredients are high-quality and treated with care. If I had to make a complaint, it’s that some of the dishes are a little under-seasoned. This is clearly a restaurant with health on its mind, and it leads to the kitchen being a little shy with the salt shaker. A dish of fried rice noodles with peanuts, pickles and chilies, for example, lacks the heat and punch that it should have, with or without meat. The same goes for their version of mapo tofu. In all it’s a minor complaint though, and perhaps it really does make the food here a little easier on the stomach. 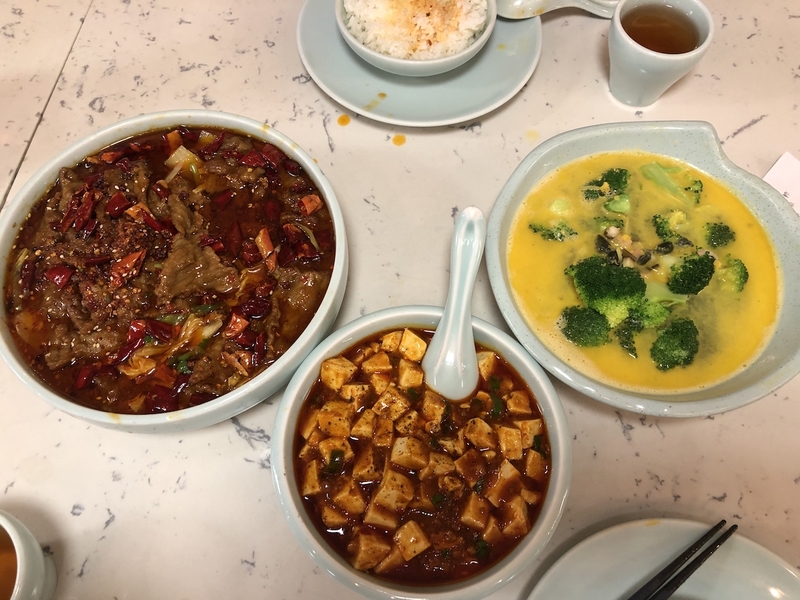 Wu Guan Tang feels like it would definitely be a good spot for vegetarians looking for something more original than fake meat and basic veggie versions of staple dishes. Crucially, it’s also just about interesting enough to be worth a visit from dedicated carnivores looking for something new. (Side note – confusingly, Wu Guan Tang shares space with Frankie’s Kitchen, a couple doors down. They might usher you down there to “check our neighbor” if the original is full, but it’s the same restaurant. Frankie’s is the one pictured). Some restaurants become clichés for a reason. Dongbei Four Seasons Dumpling King is one such restaurant, with numerous outposts around town that thoroughly dominate the cuisine of North East China in Shanghai. It’s familiar to most anyone who’s been here more than a year or two. Though all branches are pretty much similar, the Jing’an branch is one of the livelier and more atmospheric outposts. 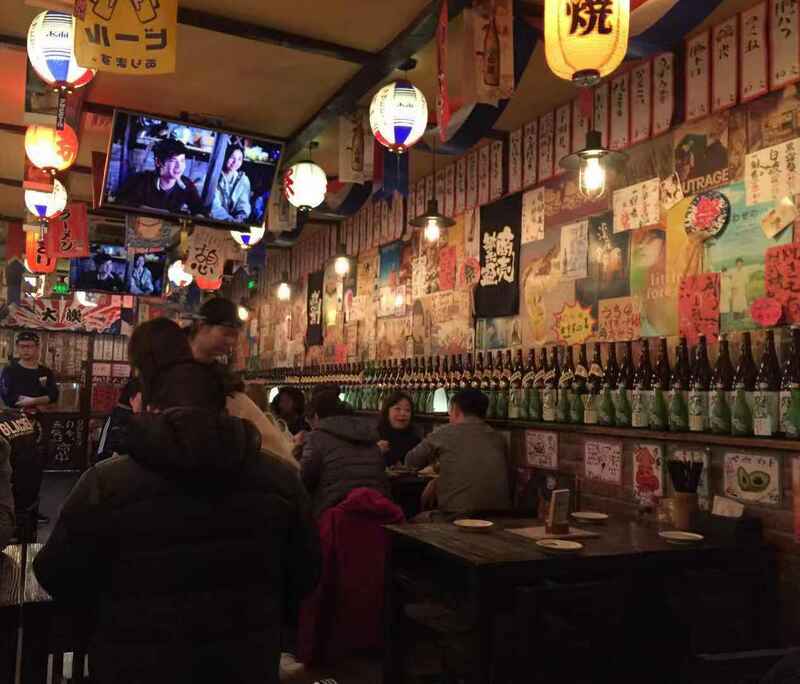 It’s fine for small, casual dinners but even better for big group gatherings, where you can order a huge variety of dishes, fill up on hearty, cheap eats and get merry on cheap Chinese beers (or your own booze; there isn’t any corkage fee and you’re free to bring in your own). For these reasons it gets picked a lot as a pre-game spot before a night out, as well as for occasions like birthdays and leaving do’s. You can leave very full for around RMB 50 a head, sometimes less. 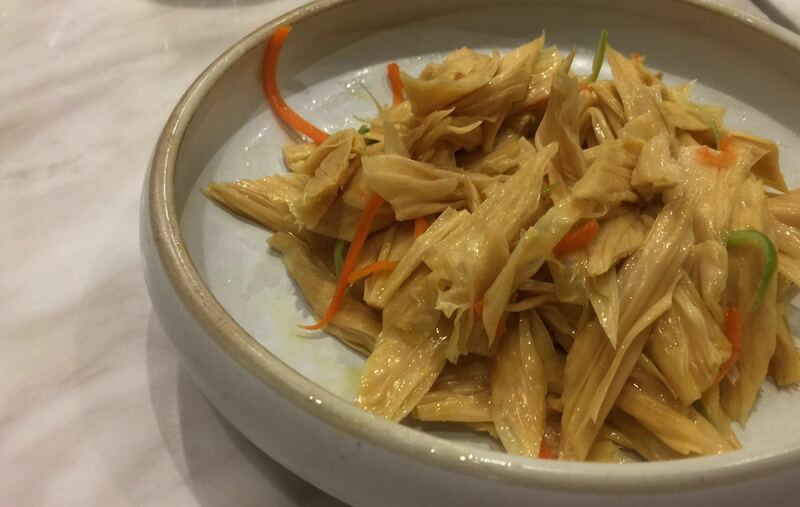 Don’t expect great service, but do expect honest, homey Chinese cooking. The menu is dominated by carbs, meat and jiaozi (dumplings) but with enough vegetable options to keep anyone of that persuasion happy (they have some good meat-free dumplings, like zucchini and egg, too). Generally you won't fine much chilli, with flavors focused more on the liberal use of soy sauce, garlic, and vinegar. The food might not look like much, but highlights are numerous. The shou si ji (“hand torn chicken”) is a whole bird smushed flat and fried so that it’s crispy on the outside and remarkably tender on the inside, falling off the bone. 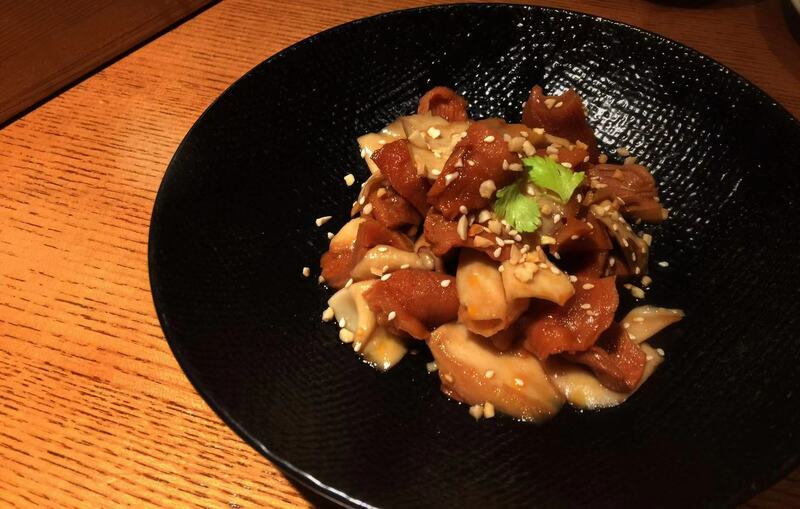 The di san xian, stir-fried chunks of eggplant, green bell pepper, and potato, is a must-order. Their numerous cold tofu and vegetable dishes are nice starters and/or palate cleansers too. And, finally, they do a mean line in fried meat. Gou bao rou, listed as “sweet and sour pork”, are monstrous cutlets of battered, deep-fried pork covered in a sweet, sticky sauce. The salt and pepper “ribs”, boneless fingers of battered fried pork, are dangerously addictive, liberally laced with salt, pepper, and presumably some sort of powerful narcotic. The setting is as fuss-free as the food and thoroughly local, with grumpy waitresses, private banquet rooms, the clatter and bang of a busy kitchen and the odd picture of Mao. 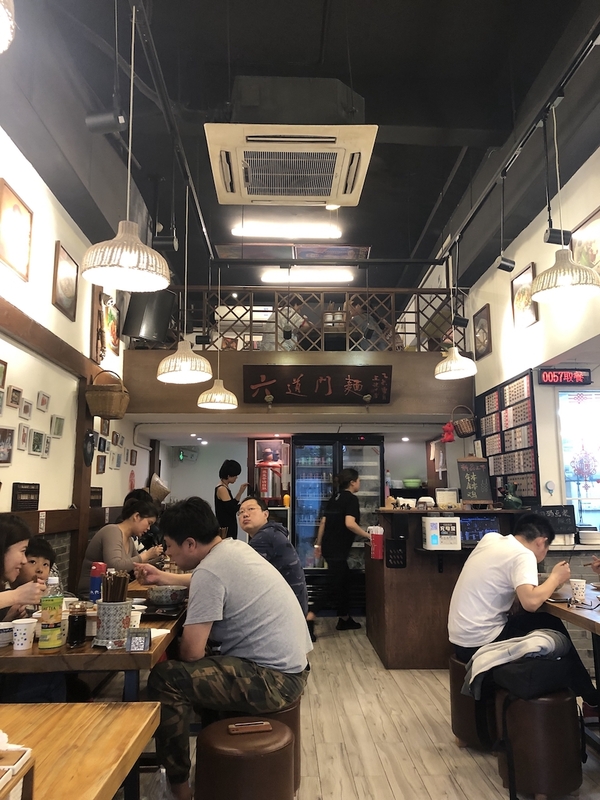 It’s noisy and welcoming, a place that dishes up comfort food for Shanghai lifers while being an approachable entry-point for newbies and out-of-towners. Try it, and you’ll probably find that your visit ends up being the first of many. Siu Loon Fung has a couple of outposts around town delivering unfussy, uncomplicated Hong Kong-style cooking. This is a Chinese cuisine that isn’t too well represented on the low-end of Shanghai dining, so this place’s authentic flavors and wallet-friendly pricing – with dishes rarely breaking the RMB 50 mark – make it well worth a mention. It’s crowded, colorful and can get a little loud, with a wide-ranging menu. All of this make it most ideal for a quick solo lunch or snack, as well as for less hurried small groups who can split a few dishes. The atmosphere feels like that of an authentic, gritty Hong Kong diner, with a lot of cultural nods in the décor like movie posters, classic HK street signs and even an old-school tape deck, as well as a Cantonese pop soundtrack on the stereo. It’s a fun place. The cheap and cheerful city vibes are reflected in the food too. Think roast duck over rice, pineapple buns and fried instant noodles rather than dim sum, opulence and afternoon tea. It’s no-frills, then, with a cooking style that is basic but hits all the right sweet-and-salty notes that this food should. Personal go-to’s are their roast meats over rice - Roast Duck (RMB 39) and BBQ Pork (RMB 42), both pictured. It’s these that you’ll see hanging behind a window near the entrance, tempting you further in. The duck leg tends a little towards the dry, but it’s made up for by the succulent breast meat. It’s hard to say much about meat over rice except that it tastes really, really good and makes for an ideal fuss-free fill-up. Same goes for the fried instant noodles and fatty beef in XO Sauce (RMB 42), also pictured. 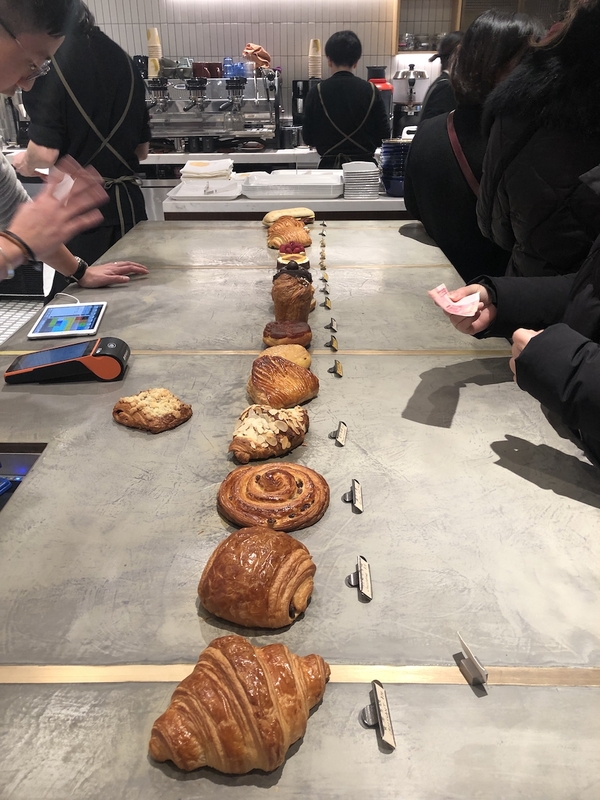 Beyond that, the menu is vast, serving everything from simple veggie stir-fries to myriad variations on fried noodles and a few classic Canto favorites – pineapple buns, char siu pork buns and the like (both RMB 10). They do proper milk tea, too, which is a nice touch. 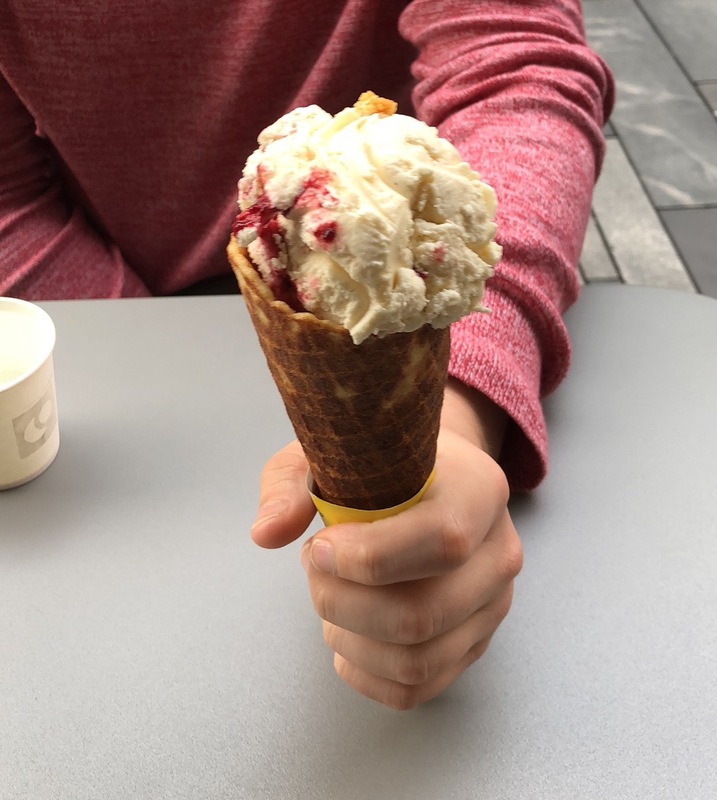 In all, it’s a great spot to hit up if you’re craving these flavors but don’t feel like anything fancy, or just want to grab a simple lunch in a place with a bit of atmosphere. 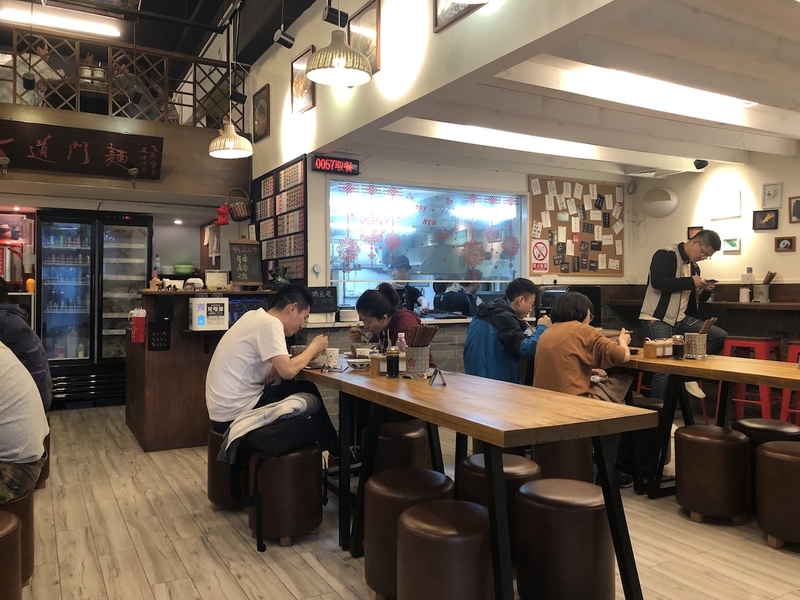 On the perennially popular stretch of Wulumuqi Lu that hosts Eli Falafel, La Vite and the Avocado Lady, there’s a good amount of decent Chinese restaurants that a lot of people seem to pass by. Sichuan spot Yi Zhang Hong is one of them. For fans of spiciness, Sichuan cooking, or just Chinese food in general it’s more than worth dipping in to. That’s especially true since, despite its reasonable prices and unassuming demeanor – it’s a relaxed, cozy space – it manages to answer a few of the criticisms that this famous cuisine most commonly faces. Its Sichuan food with a fresh pair of kicks, cleaned up just a little bit with a focused menu, a smidgen less oil and apparently no MSG. And it's all that while remaining unadulterated and plenty hot. A good place to start is by splitting one of their “Griddle” dishes, a big dry-fried pot of chili, lotus root, celery and other goodies along with your choice of protein. These range from chicken to bullfrog to eel to pork intestine at RMB 78 to RMB 88. The diced, bone-in chicken is great, crispy and tender in all the right places, but the intestine might be even better. The generous sprinklings of chili and Sichuan pepper cover up the more offal-y notes of the organ, leaving behind just crisp skin and rich fat. It’s a real treat. The mapo tofu (RMB 38) is one of the best I’ve had this side of Chengdu. It’s a standard rendition but it packs so much heat, pungency and flavor, flavor that seems to come from confident and well-executed seasoning rather than a simple barrage of oil and chili. Though there is of course a decent amount of those too. Beyond that there are a number of classic Sichuan staples – cold chicken served in chili oil (RMB 38), pork wontons in a variety of spicy sauces (RMB 18), dry-fried green beans (RMB 28) – prepared as you’d recognize them with maybe just a touch more finesse. There are some more singular small plates too, of which soy sauce marinated and braised pork (RMB 38), though a bit pricy for a small plate, is worth a shout. It has those great earthy undertones that meat gets when its spent just the right amount of time sitting around getting funkier. Think of it like Sichuan prosciutto. Kind of. On my last visit, four dishes between two came to just under RMB 100 a piece (admittedly with no drinks). Outside of chains like Spicy Joint that’s a good price for a Sichuan meal like this, with better cooking and a much nicer atmosphere. Xime does Japanese comfort food with inventive twists in all the right places, in a laidback, stylish setting with decent pricing. Usually a great soundtrack, too. That makes it kind of unique given that downtown Shanghai’s Japanese places, as good as some of they are, tend to be either classic izakayas, all-you-can-eat teppanyaki black holes and performative, high-end sushi spots. What really separates it is the menu, though. It goes deeper than sashimi – though they have that, too, at a great quality to price ratio – offering everything from hearty, shareable Japanese hotpot to soba and rice sets, udon noodles and more. They even do Japanese sandwiches filled with things like grilled mackerel and pork katsu. My most recent visit was on a Monday night, when they do a killer buy-one-get-one deal on all their bowls of udon noodles. The original prices of these hover between the mid-50’s and mid 70’s, so you can get a big hearty bowl on the cheap and free up some wallet space to split something else between a party of two. I’d recommend the sesame salad, the proper name of which I unfortunately can’t remember (pictured). I’m a big fan of the Beef Curry Udon (pictured). It’s a dish I tried when visiting Tokyo and I honestly don’t know why it isn’t more prevalent abroad. The version here is as good as the version I had there – rich curry broth, tender beef slices and toothsome noodles. It contains a sprinkling of pumpkin seeds and raisins, which do wonders for the texture of the bowl and add little bumps of sweetness. The menu is full of these nice little details that add a bit of depth to everything and remind you that this is a more modern, explorative kind of Japanese spot. Another udon highlight – the chicken meatball version, which comes in a lighter broth with extra chewy pieces of tofu. It’s chicken noodle soup’s way hipper cousin. Order it on a cold evening. That’s a round-up of some very specific dishes, but it gives you a good idea of what you’re going to get here. It’s quality stuff, hearty and familiar while still being interesting enough to get foodies talking over the table. In a chill environment, to boot. A neighborhood spot that’s worth travelling to even if it’s not in your neighborhood. Also, when I sat down to eat last week they were playing Outkast’s ‘Spottieottiedopalicious”. That’s an extra point right there. You can get soup dumplings everywhere, but their quality varies greatly, and it can be hard to know whether the one on your block is going to be good or not. Fortunately, the ones on my block are great. 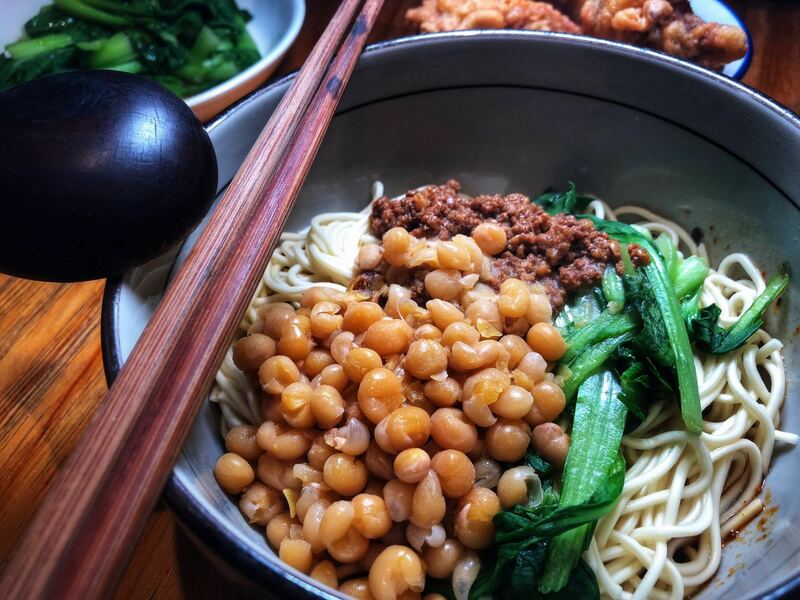 These are the crown jewels of Shanghai and Jiangsu cuisine, and Fa Hua Tang Bao on Fahuazhen Lu is the spot to get your fix at a seriously great price if you’re in and around Changning. This is very much a no-frills, neighborhood joint, but it’s very clean and consistent. 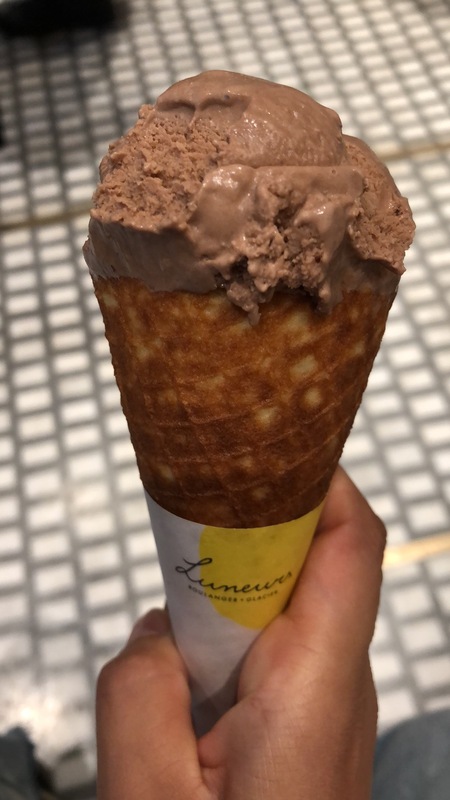 It’s also a great place to try Shanghai’s greatest culinary invention outside of more refined spots like the oft-cited Din Tai Fung. Dumplings and soup are the focus of the very small menu, which is helpfully plastered on the walls, including pictures and English names. Don’t think too hard about it though, because there’s no real need to stray away from two core items. Look around and you’ll see groups of people ordering either simple pork xiao long bao or steaming bowls of laoya fensi tang (literally ‘Old Duck Sweet Potato Noodle Soup, so named because it’s thought that old birds create the most nourishing soup). First the xiao long bao, an absolute steal at RMB 10 for 1 long (eight dumplings, labelled “Meat Soup” on the menu). These are served up, to my mind, exactly how they should be. The skins are thin and delicate, and the broth inside truly warming and rich without feeling too greasy or fatty, an issue that you’ll find at other cheaper xiao long bao spots. (Also, the chili here is always fresh and packs a real punch, something to watch out for at any place where dumpling dipping is integral to enjoyment). Nibble a hole, slurp out some soup, dip in chili and vinegar and sigh. This right here is Shanghainese comfort food that lets you know, soothingly, that all is right with the world. There are other varieties, too. A meat and shepard’s purse variety (RMB 15, “Cooking Soup” on the menu), which I’m partial to for the sake of variety, is decent but not as good as the meat ones. They’re less soupy and therefore less satisfying. Crab and pork xiao long (RMB 30) aren’t crabby enough to merit the increased price tag. There is also an advertised “Homemade Soup” version for a comparatively eye-popping RMB 50 which I am yet to sample and perhaps never will; I simply can’t imagine them being five times better than the exceptional RMB 10 treats that keep me coming back. Basically, stick with the RMB 10 “Meat Soup” xiao long bao. They’re cheap and absolutely great. Now, to the second item that you’ll see on pretty much every table. Listed as “Duck Vermicelli Soup” in English, the laoya fensi tang (RMB 15) is a great accompaniment to a round of dumplings. It’s a staple in this part of the country, and it definitely packs a bit of that undefinable “home-cooking” feel. It might, however, be more of an acquired taste given the fact that along with cilantro, chewy fried tofu and glass noodles, the principle ingredients are duck stomach and duck blood. Yum. The stomach actually has a texture not too dissimilar to normal flesh. The iron notes and firm-jello texture of the duck blood cubes might be less appealing but might not be too unfamiliar to anyone that is partial to, say, blood sausage. There’s a reason that everyone in here is eating it. It tastes good, if you can get used to the flavors and textures. If not, you’re totally fine to simply order a bowl and request that no duck parts are included. It’s still a satisfying way to feel a bit fuller than you’ll feel if you just eat dumplings, particularly in the winter months. If you are going to be adventurous, adding chili and a little vinegar goes a long way toward masking some of the duckier offal aromas. The final thing I’ve failed to mention are the shao mai, small chewy rice dumplings that usually contain a small chunk of dry pork (RMB 10, labelled “Three small dumplings”). They’re fine. Nothing stellar but a decent filler if you don’t feel like noodles / soup. The place can be tricky to find the first time you go. In the second half of 2017 all of the store fronts on Fahuazhen Lu were boarded up, meaning that you have to find alternative ways to enter them, usually via the entrance of whatever compound their building is in. Fa Hua Tang Bao can be reached by the main door of a residential building - fortunately, the kitchen has a street-facing window, so you should be able to spot it. It’s a fun atmosphere. Small, cramped and often loud with brusque service. When I visit on weekend mornings the crowd always seems to be a mixture of young mums and dads with their children, old neighborhood locals and kids that could have stumbled right out of Dada a couple of blocks over. Good vibes. And seriously good dumplings.